"A new twist for mashed potatoes. I usually add a dash of onion and garlic powder. I also do a taste test prior to baking to see if they need more salt. Potatoes are combined with cream cheese, sour cream, chives, butter, and paprika...Delicious!!" Place potatoes in a large pot of water. Bring to a boil, then reduce heat to medium-low, cover, and simmer until tender, about 20 minutes. Drain. Combine hot potatoes, cream cheese, sour cream, butter, and salt together in a large bowl. Mash until creamy. Spoon potato mixture into a 2-quart casserole dish. Sprinkle with chives and paprika. Bake in preheated oven until bubbling, about 30 minutes. The cream cheese was overpowering. It tasted like potatoes mixed with cream cheese. I won't be making this again. 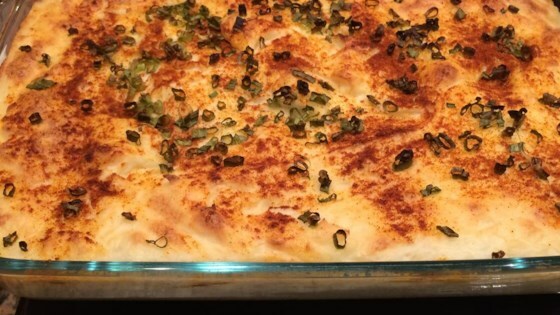 This is one of our favorite potato recipes. I've even made it using instant potatoes and it came out good. Also I like to mix the chives into the mashed potatoes rather than on top.